It's Chelsea: Bourjois Rouge Edition Velvet Lipsticks Review! 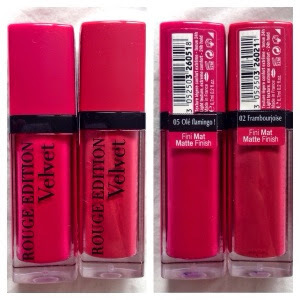 After the dust has just settled down about the new Bourjois Rouge Edition Velvet Lipsticks, I have hopped onto the bandwagon and decided to give them a go! I was a bit skeptical as I'd never tried matte lipsticks before, but you know what? You have to be brave with makeup sometimes - especially as it's now summer (as far as England goes) and it's the perfect chance to try out bright lip colours. I'm going to cut this review to the point. The verdict: AMAZING. I can't believe it took me this long to try them out. 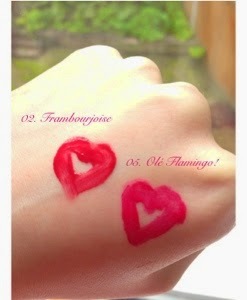 I bought two, Ole Flamingo, which is a vibrant dark pink and Frambourjoise, a red berry colour with a slight pink tone. I can't decide which one I love more, but I do think Frambourjoise is probably a more wearable colour on a daily basis. The Bourjois Rouge Edition Lipsticks are £8.99 from Boots, but Boots are always doing 3 for 2 offers! I will definitely be going back to get some more, maybe Peachy Club? Great shades - not too bad price wise either.